Freshmen and sophomore students are usually advised by the academic advisors of the Student Services Office. 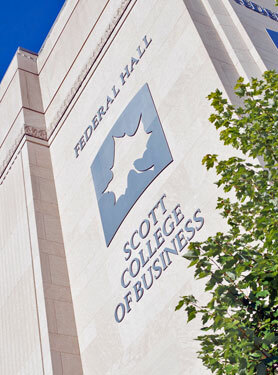 The SSO is located in Federal Hall, Room FD124 of the Scott College of Business. Due to demand, the Scott College of Business is pleased to offer additional web classes for the Business Administration degree via distance education. The table below shows a regular schedule in which business core courses and the major emphasis courses are offered every other semester. Certain classes (BUS 305, 401 and BEIT 336) will be offered each fall and spring semester. Some of these classes may also be available during the summer on an irregular basis; summer offerings may take place in a five-week accelerated session and are not recommended for those with full-time employment schedules. Please contact the Extended Learning Center at 812-237- 2345 for more information about courses for College of Business distance students.